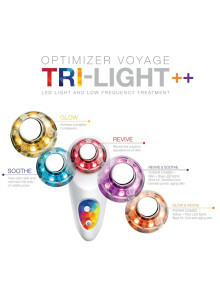 Skin Inc’s award winning and ultra coveted Optimizer Voyage Tri-Light++ is now supercharged with 2 brand new power combo lights for the ultimate bespoke facial. 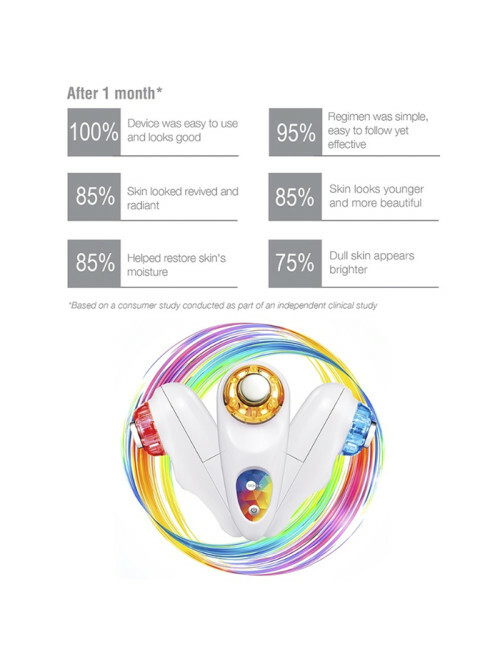 One device, 5 benefits - Revive, Glow, Soothe, Optimize and V-Sculpt. 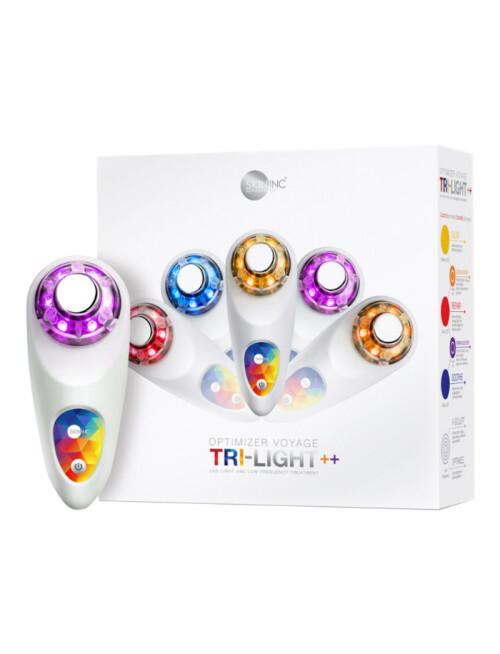 The new game-changing Optimizer Voyage Tri-Light++ combines the power of NASA-inspired LED Chromotherapy and Low Frequency Stimulation to tackle multiple skin concerns for younger looking, brighter and blemish-free skin. In addition to the original 3 targeted LED lights (Red, Blue, Yellow), the Optimizer Voyage Tri-Light++ features 2 new power combo lights (Orange & Purple), which deliver twice the benefits in the same amount of time. Customize and enjoy 5 benefits at one-go! REVIVE with the Red Light - For an all-over improvement in skin elasticity, look of fine lines, and youthful appearance. SOOTHE with the Blue Light - To soothe and calm your skin, help reduce excess oil production and skin congestion. GLOW with the Yellow Light - To brighten your skin tone, alleviate under eye darkness, and reduce the appearance of scars. 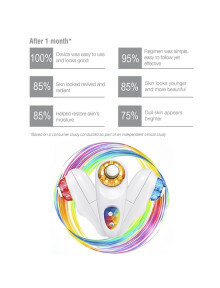 GLOW & REVIVE with the power combo Orange Light - Perfect for dull, aging skin, Orange lights combines the benefits of Yellow and Red Lights to tackle pigmentation, dullness, fine lines and wrinkles. REVIVE & SOOTHE with the power combo Purple Light - Ideal light for those who struggle with sensitivity or skin congestion and have anti-aging concerns. Purple light combines the benefits of Red and Blue lights to gently get skin back on track and problem-free. OPTIMIZE and V-SCULPT with Low-Frequency Stimulation - To boost the absorption of ingredients from your skincare and v-sculpt facial contours for a more lifted look. 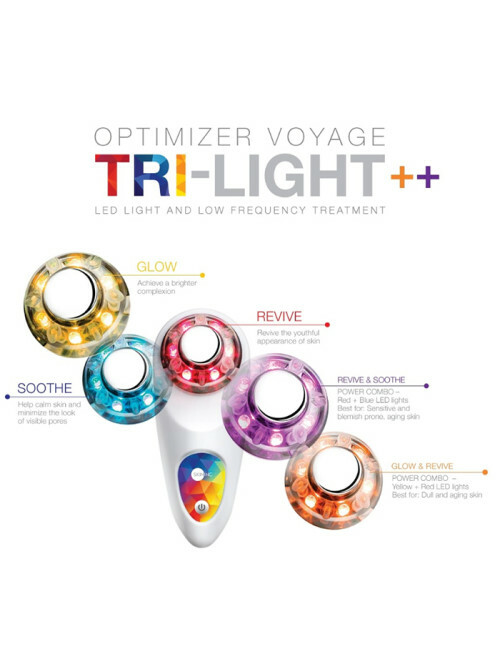 The Optimizer Voyage Tri-Light should be used with water-based products and we recommend using it with Skin Inc serums and Pure Deepsea Hydrating Mask for best results. For optimal results, use with Skin Inc Pure Revival Peel, Encapsulated Serums and Pure Deepsea Hydrating Mask. The Pure Deepsea Hydrating Mask contains nutrient-rich Okinawa deepsea water, Soy Bean extracts and Hyaluronic Acid to hydrate, clarify and brighten your skin, all in a single step. In addition to the benefits, the gel-like texture of our mask also serves as a medium for the device to glide over your skin easily. After applying a water-based serum or mask, remove the clear plastic protective cap, switch on the Optimizer and apply the metal probe directly to skin. Use gentle, clockwise circular and upward motions to massage the area. You can use for up to 10 min per application, twice daily. The device will shut off automatically after approximately 10 minutes. If you use more than one light, do not use the device beyond 10 minutes per use. Avoid using too close to lashline and eye-lid area. To clean the device, use a damp cloth or antiseptic wipes to wipe the metal probe. Device operates on 3 x AAA batteries. Meet Asia's newest skin care craze! Made in Japan and formulated without fragrance or parabens, Skin Inc's innovative, fuss-free product allow you to create a custom regimens based on your skin unique's needs. This personal approach has made the brand favourite of beauty fanatics across Europe and Asia, winning over 50 beauty awards worldwide.